Home » About » News » Dr. Ole Mikkelsen takes over as President and CEO of Sequoia Scientific., Inc.
Dr. Ole Mikkelsen takes over as President and CEO of Sequoia Scientific, Inc.
Dr. Mikkelsen holds a PhD (2001) from the University of Copenhagen in Denmark and two decades of experience in sediment transport, particle measurements, instrument design, sales & marketing. 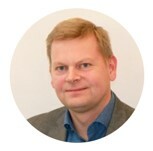 He comes to Sequoia from a position as System Sales Manager with MacArtney Underwater Technology Group in its Danish HQ. Dr. Mikkelsen wrote his PhD thesis based on his work on suspended sediment dynamics in Danish coastal waters. Subsequently he held postdoctoral positions at Dalhousie University in Canada and Bangor University, Wales. From 2007 to 2013 he served at Sequoia as its VP of Sales & Marketing before relocating home to his native Denmark to work for MacArtney. He returns to the US having accepted the challenge to take Sequoia on a growth trajectory effective 1/1/2019. Yogi Agrawal transitions to President Emeritus, continuing support of technologies and Business Development. Sequoia was founded by Dr. Yogi Agrawal with partner Chuck Pottsmith in 1995. Beginning with their first product, a LISST-100 particle sizing instrument, the two co-founders developed the successful LISST series of laser and acoustic instruments for measuring marine-aquatic sediments. Throughout, Dr. Agrawal continued his involvement in the scientific community, publishing extensively, including with Dr. Ole Mikkelsen. He plans to continue support of ongoing and new technologies, although at a reducing commitment level. His next serious assignment is to amuse his growing brood of grandkids. He is not retiring, quite yet.